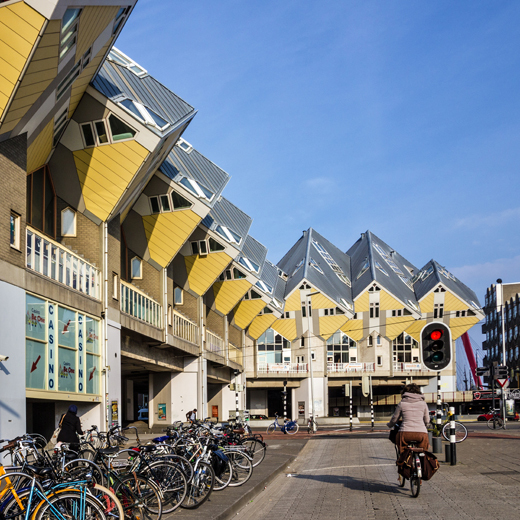 In Rotterdam, a city in southern Holland, there are 38 of the most unusual and coolest homes ever built. Called cube houses, they are exactly what the name suggests. So why are they unusual? After all, Taiwan and many other parts of the world have thousands of homes in the shape of cubes. 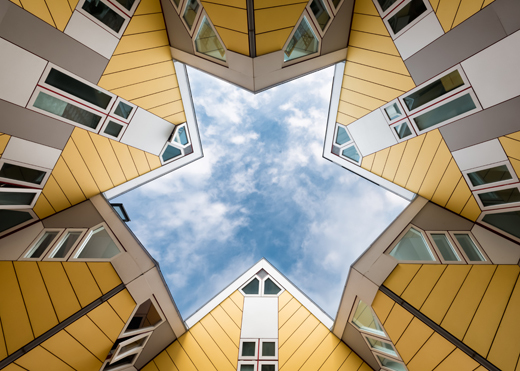 Rotterdam’s cube houses are unique because they are tilted1 on a 45-degree angle and placed on top of a hexagonal2-shaped pylon3. Each of the individual houses has been designed to look like a tree. In addition, because the 38 tree-shaped houses are joined together, they look like a large, futuristic forest even though they are painted yellow and were designed in the 1970s. These four-story homes all have 100-square-meters of living space. The ground floor is the entrance, the first floor has a living room and kitchen, and the second floor has two bedrooms and a bathroom. The top floor has many windows and is sometimes used as a garden. 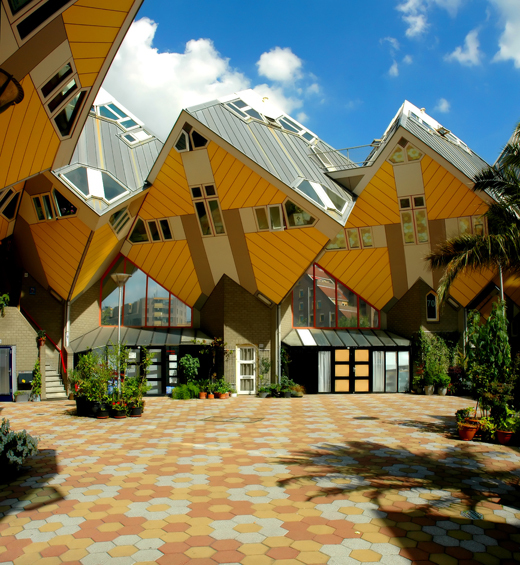 The cube houses are privately owned, but attract thousands of tourists each month. With this in mind, one cube house is used for visitors who want to photograph and look around inside. The mouse ate three cubes of cheese today. It is very unusual to have snow here in July. Under Mr. Wang’s guidance, my English has improved by degrees. You’ll agree with me if you look at this issue from a different angle. I made a heart-shaped cake for my boyfriend. Maria lives inside a 10-story building. There is only one entrance to this building. With his weekend plans in mind, David decided not to work overtime on Friday.